Caffeine is a naturally occurring stimulant found in foods such as tea, coffee, cacao and kola nut. Primarily found in the seeds, leaves and the fruit of more than 60 plants, caffeine can be extracted and used in a concentrated form as a dietary supplement. Green tea extract marketed in pill form boasts health claims based on both the antioxidant and caffeine properties found in green tea. 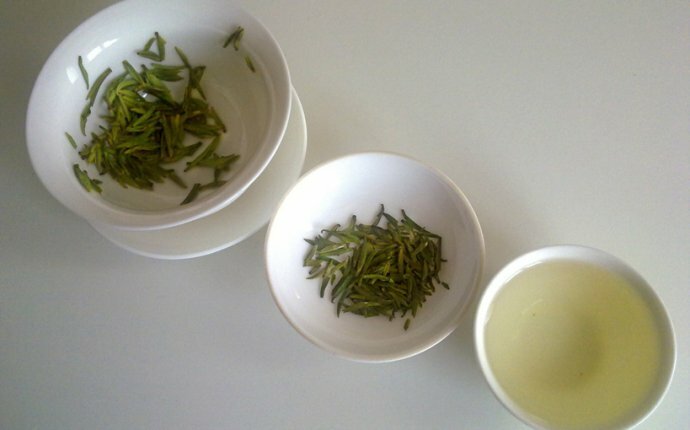 Green tea originated in China. The beverage is made by steeping tea leaves. Of the three predominant types of tea-green, black and oolong-green tea is the least processed and is rich in antioxidants. The major polyphenols are catechins, epigallocatechin gallate (EGCG) and epicatechin gallate (ECG). These are the substances most often promoted in an extract and found in concentrated form; however, the EGCG has the highest concentration of polyphenols, which are known for their inflammation-reducing properties and potential weight loss effects. Research points to the fact that the combination of polyphenols plus caffeine may result in prolonged thermogensis-heat production-which contributes to the prevention of weight gain, according to a 2000 monograph in the "Alternative Medicine Review." In a study conducted by Karen Andrews, Amy Schweitzer and Cuiwei Zhao, et al., published in "Analytical Bioanalytical Chemistry, " the caffeine content of dietary supplements commonly purchased in the U.S. was analyzed. The study reviewed green tea extract products for which caffeine content was stated on the supplement label and products for which no caffeine information was provided. The study found that the caffeine content of green tea extract supplements with no specific label information ranged from 0.60 mg/day to 20.01 mg/day. Additionally, the study stated that products with specific label information about caffeine content ranged from 100 mg/day to 150 mg/day. By comparison, one 8-ounce brewed cup of coffee provides about 95 mg, according to the USDA National Nutrient Database for Standard Reference, but will vary depending on the type and strength of the coffee, whereas the caffeine content of an 8-ounce cup of brewed green tea ranges from 10 to 50 mg, depending on the variety. Green tea extract supplement bottles are loaded with claims that the products will "speed up your metabolism, " "increase calorie burning, " "enhance your immune system" and "kick start your fat burning." A research article in the "American Family Physician, " published in 2009, suggests that green tea has cancer-fighting, antioxidant and inflammation-reducing effects and a possible role in cardiovascular health and weight management. However, further studies are needed to confirm these benefits. If you are determining whether a supplement is right for you, first check with your doctor. Decide what it is you are looking for, whether it be weight loss, caffeine or an antioxidant boost. Diet and exercise are key to keeping your figure trim, and exercise will kick-start your metabolism and burn calories. According to Craig Schneider, M.D., Maine Medical Center, Portland, Maine, and Tiffany Segre, M.D., Gorham Family Medicine, Gorham, Maine, drinking green tea is a great way to amp up your antioxidant intake, relax and take advantage of all the nutrients the plant has to offer.